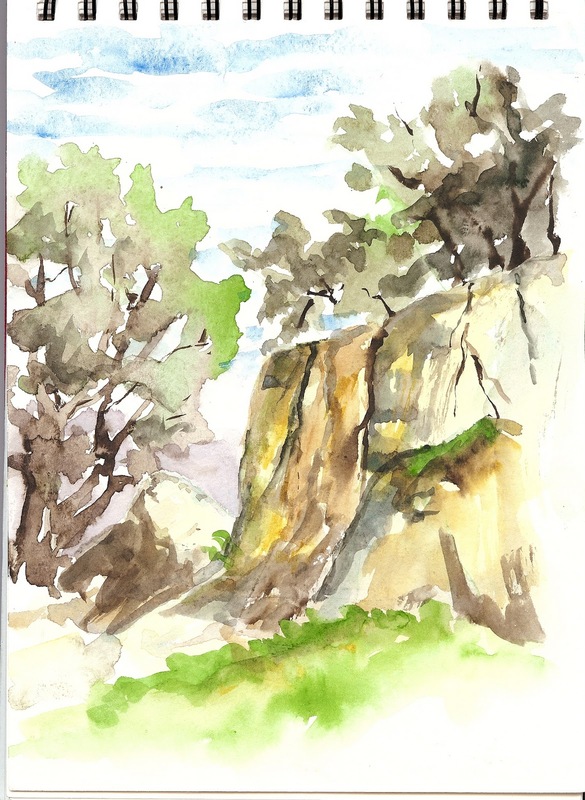 On Thursday the SCVWS Plein Air painters went to Guadalupe Oaks Park-a 63 acre park with lots of beautiful oak trees in the middle of a residential area. There are a couple of surprisingly high hills in the park, which give wonderful vistas of the valley. Mary Paquet even found a spot where she had a view of the downtown SJ skyline. There were 6 of us and we had a great time painting and helping Paint Site Leader Jenny Tero come up with ideas for the quilt she's making that illustrates Beatles songs! I did the first painting below of a cliff face in the old sandstone quarry in my Cachet spiral-bound book, 10" x 7". The cerulean sky granulated way too much, but there were plenty of streaky clouds. By the way, several of the buildings in San Jose's downtown were constructed using sandstone from the quarries in Almaden, including what is now the SJ Museum of Art (originally the post office.) Also, the charming Romanesque Revival Leticia Building on north First Street, which is now occupied by a law firm; the structure dates from 1890. A number of years ago, my dear friend, Eileen Connery, and I organized architectural walking tours of downtown and both of these buildings were on our tour! The second is a different quarry view-I did this one on that odd little 4" x 10" Arches cold press block. A little more work would probably improve it-I began a bit of negative painting at the top of the cliff, which I like, but I don't want to overdo, so...maybe I should just leave it alone and get on with life! Janice, both of these paintings are lovely and I have a hard time deciding which I like best. I am especially intrigued by the shapes you captured in the second piece. The Hike and Sketch was another wonderful day of art. Thanks for giving the architectural history. I learned some new facts!